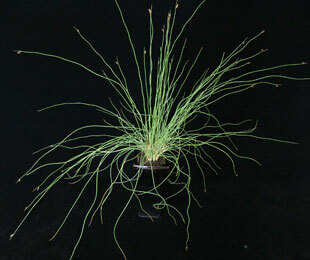 Description: Twizzler™ Lepironia has stunning twisted glaucous reed like foliage that provides a great architectural element for wet and dry landscapes. Interesting and small conical shaped seed heads appear on the upper reed stems from summer through to winter. Size: 1 – 1.3m high x 40 – 60cm wide. Uses: Wet and dry landscapes. 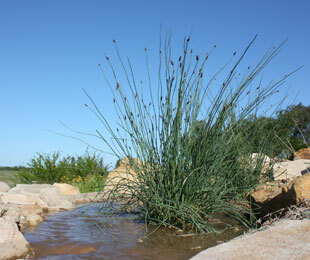 Water features, ponds, wetlands, bog gardens, raingardens, pots and dry gardens if irrigated. Position: Full sun to 70% part shade. Tolerates frost and drought. Twizzler™ Lepironia suits loam to clay loam moist soils and can be used in water up to 200mm deep. Works for coastal areas but requires protection from fully exposed seaside aspects and heavy frosts. 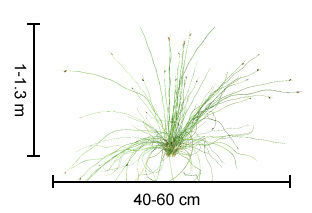 Care: Water as required for 8-13 weeks until established, needs irrigation in summer. Plant in a well mulched garden if not in water (chunky mulch is recommended). If required use slow release fertiliser in spring. Every 3-5 years cut back to 20cm above the ground (will look better with pruning every 3 years, this depends on your requirements). For more detailed information on Twizzler™ Lepironia click here.